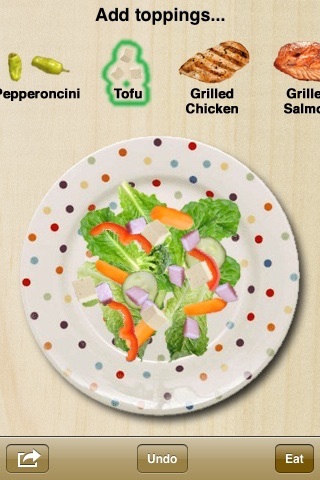 Put a salad bar in your iPod Touch or iPhone! 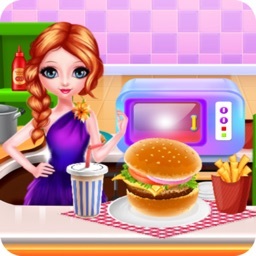 It's the latest food app from Maverick Software, the creators of the hits Cupcakes!, More Sundaes!, More Toast! 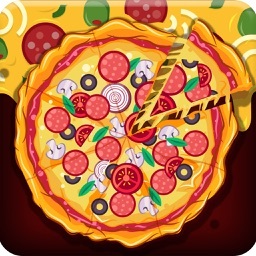 and More Pizza! 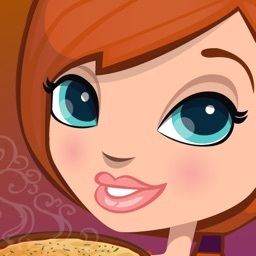 - Taco salad ingredients - edible tortilla bowl, taco meat, salsa (red & green), sour cream and guacamole! 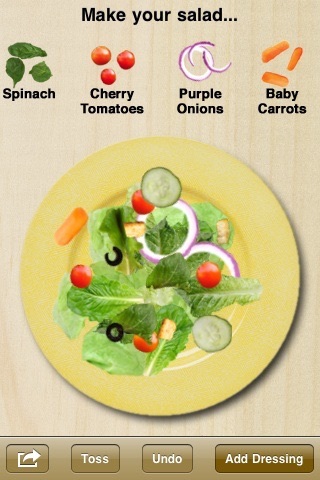 - A salad-meter option with worldwide rankings! More Salad! 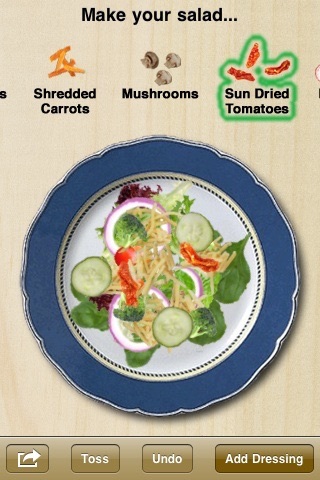 gives you all the ingredients you need to make, eat, and share virtual salads. First, pick your favorite plate, then load up with 50 different salad fixings, from all kinds of greens to veggies, fruit, nuts, and cheeses. 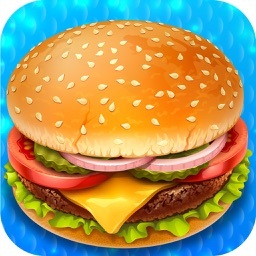 Put as much or as little as you want on your plate, then shake your phone to toss it together! Next, you can pour on 7 dressings, including classics like ranch, italian, french, caesar, thousand island, blue cheese, and oil & vinegar. 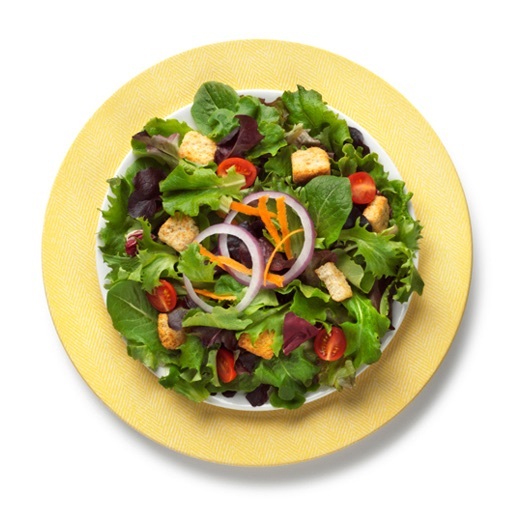 If you want to coat your salad with dressing, toss it again! Finally, add toppings like tofu, bacon bits, grilled chicken, salmon, or croutons. 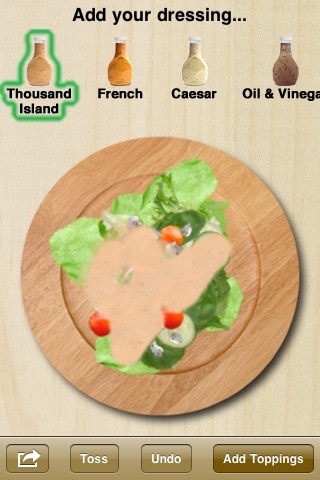 When you're done, you can virtually eat your salad, a bite at a time. Or email a photo (even including an automatically built recipe card!) to a friend. 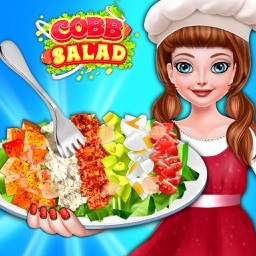 You've made cupcakes, toast, and pizzas on your phone, now it's time for a salad! If you have suggestions for new features or toppings, post a review and let us know! 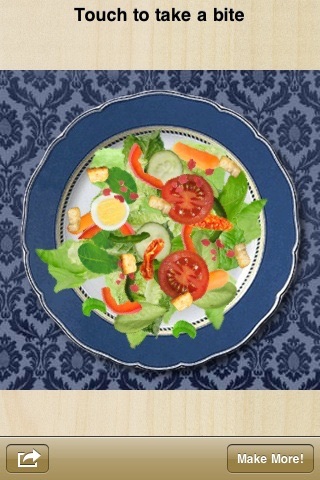 Similar Apps to More Salad!